I have come a long way since my first time at FOSDEM a couple of years ago. The first time it was all new and unknown. I tried to attend as many talks as possible, but could only see half of the talks i wanted to go (amazing how many people there are at FOSDEM). Every year I listened to fewer and fewer talks, because conversations I had outside of talks are so much more fun and appealing. I think the biggest thing which changed is that I’m no longer just a user of free software, but an active contributor. This year, I spent a lot of the time at the GNOME booth, which is always fun. The GNOME beers event is also awesome, though it was really crowded this year (let’s hope we get a bigger space next year). On Friday we also had a great lunch at a Libanese restaurant. 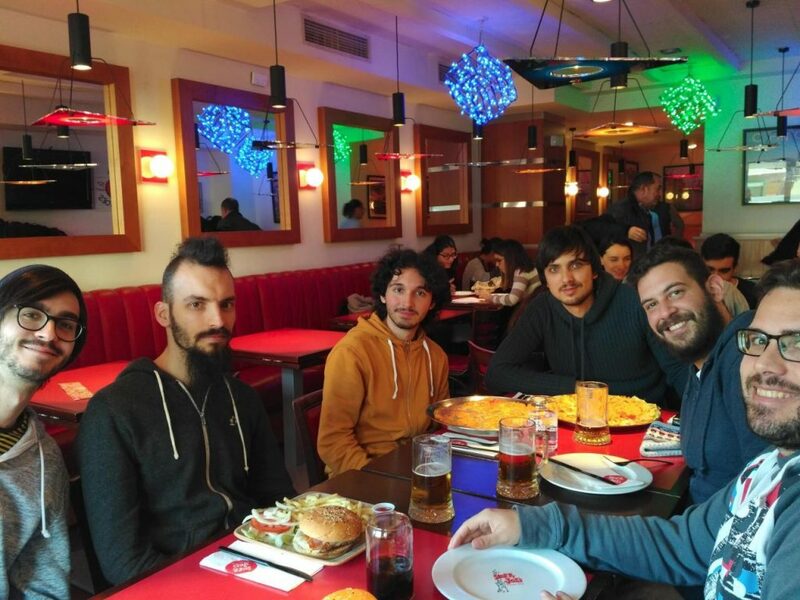 Thanks to Adrien for organizing, and thanks to Purism for offering lunch. While there, I also did some work on Fractal. I investigated why Fractal uses a lot of CPU and memory and made changes to reduce memory usage. I stayed at a flat together with Bastian, Niclas, Florian, and Tobias. 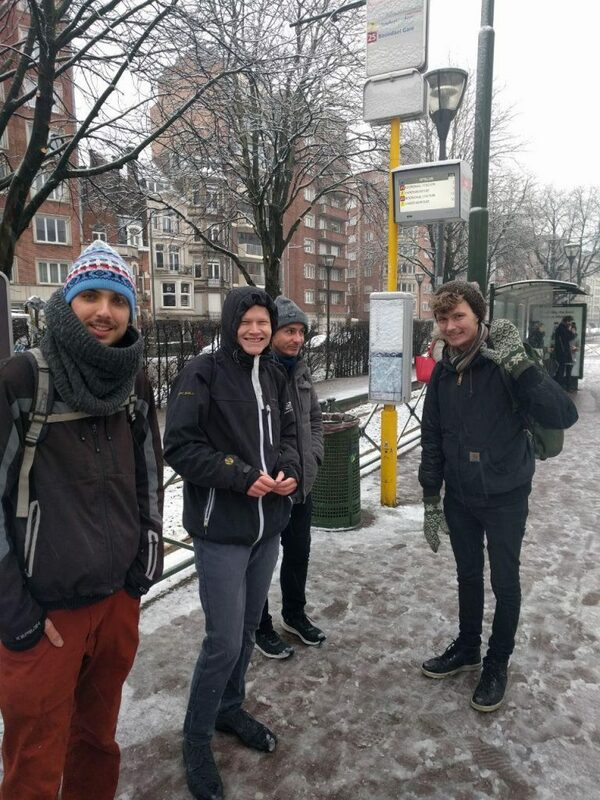 Thanks a lot for the good time in Brussels, especially to Bastian for organizing the apartment. 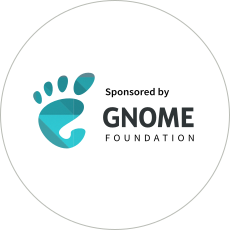 Special thanks to the GNOME foundation for sponsoring the trip to Brussels. 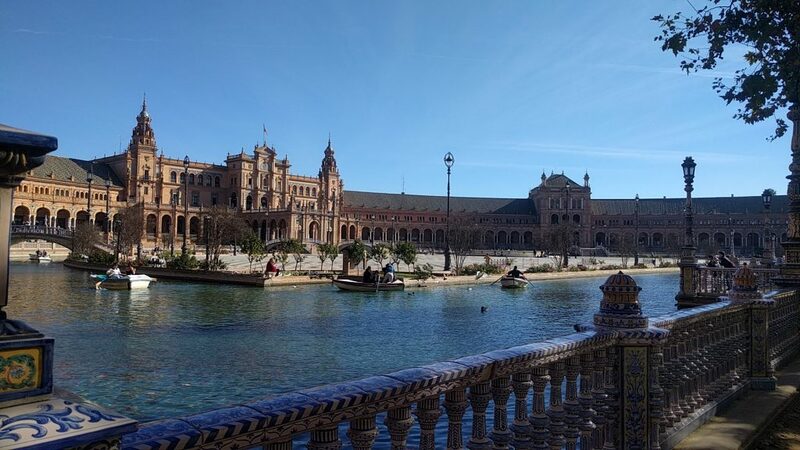 Last month I was in Seville for the second Fractal Hackfest. 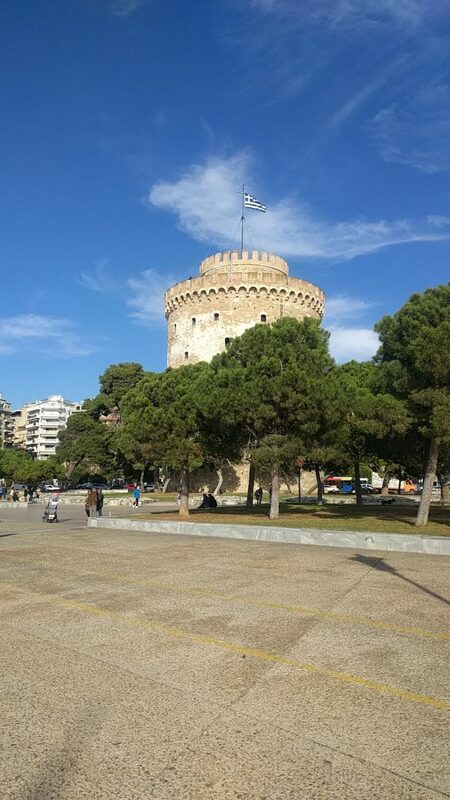 It was a bit of a different experience for me than the other hackfests I have been too, as I’m a core member to the project now, and I also knew most of the other people already. 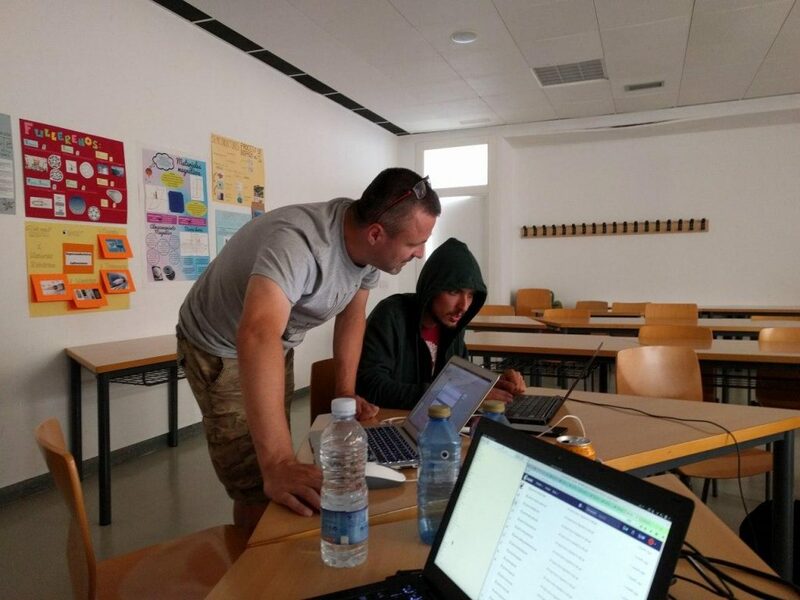 My main focus for this hackfest was to push forward the work on the Fractal backend. The backend should handle persistent storage and the preparation of data needed in the UI. Right now many things which should conceptually be in the backend are in the frontend, and can therefore cause UI freezes. Over the past months I have been working hard on refactoring the code so we can just drop in the backend without making many changes to the UI code. So the core of the refactors I did was to make sure that data flows in one direction and we don’t keep different copies of the data around. For storage we decided to use SQLite instead of LMDB because we have many relations between the data. The data will be structured into 3 tables: USERS, ROOMS, MESSAGES. This gives us a lot of space to expand and allows us to reference to other data with ease. The backend will have use a glib based API to communicate with the frontend, and on the other hand it will have a Rust only interface to communicate with fractal-matrix-api. We also had really awesome community bonding events, and some local newcomers joining the hackfest. Thanks to Daniel for organizing the event and also all locals who helped him. A few weeks ago, while working on Fractal, I rediscovered something I had completely forgotten about: GAction. I don’t remember how I came across it, but it was definitely love at second sight, because for the next days I didn’t do much other than refactor Fractal and replace code with Actions wherever I could. Of course, if you like something a lot you have to be careful to use it only where it’s appropriate. For me it was basically when it’s a user action then it should use GAction, or in other word if it’s a response to an user input, like clicking on a button, then it should be a GAction. Now, how do you use GAction? Since GAction is only an interface we need to use a class implementing it. The most simple class we can use is of course GSimpleAction as the name already implies. Since I’m writing most of my code in Rust these days, all examples will be in Rust. The above code shows how an action is created. Let’s see how you can use it. The first thing we need to do is add the created ActionGroup to a Widget. The action will then be available for all children of that widget, so it’s best to add it to a Container or a Box which allows us to have children. You could also set the properties via the .ui file. When you replace the event handlers of clicks with actions you can really streamline your code base. I showed the basic usage of the GAction in the above examples, but you should definitely have a look at the GAction documentation to see all the potential it has. Also, GPropertyAction is awesome because it allows you to control GObject properties directly via Actions. Sadly, the Rust bindings for it are not in a stable release yet, but they were added to master a couple of months ago. After three months of hard work and a lot of coding the Google Summer of Code is over. I learned a lot and had a lot fun. 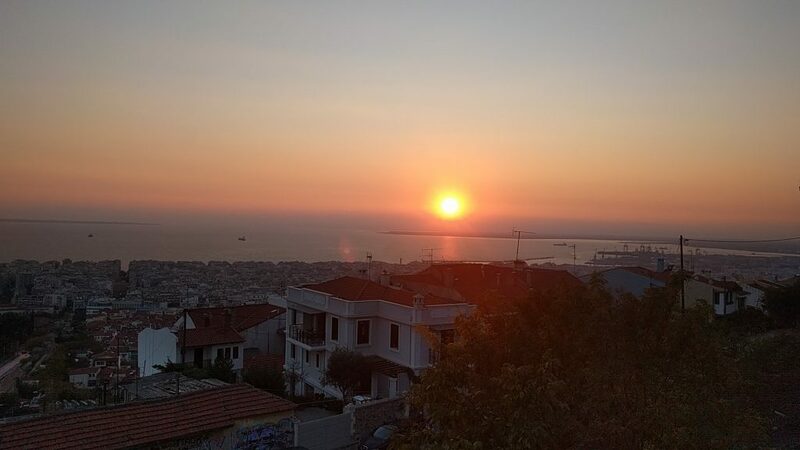 GSoC was an amazing experience and I encourage everybody to participate in future editions. At this point I’ve been a contributor to GNOME for nearly a year, and I plan on sticking around for a long time. 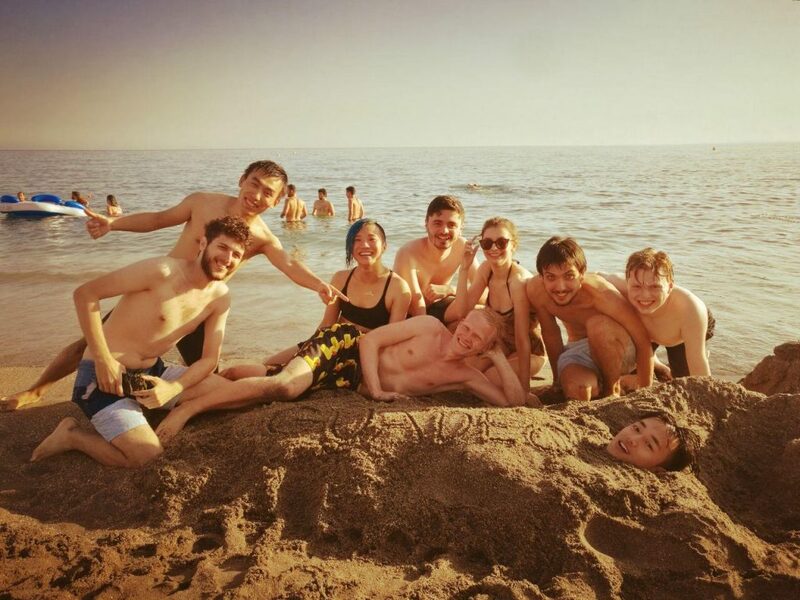 I really hope that other GSoC students also found it so enjoyable, and keep contributing to GNOME or other Free Software Projects. This will be my final GSoC post, so I will summarize what I did for Fractal in the last couple of months, and what I didn’t finish before the deadline. I completed some of the tasks I proposed for GSoC already before the Coding Phase. It was really nice that we had a meeting with Daniel (my mentor) and Eisha (my co-GSoC student) every week, and also some other core members working for Fractal joined sometimes. During these meetings I could get feedback from Daniel and discuss tasks for the next week. We had a really good workflow. I guess that was also a reason that I started working on some imported tasks and not only on things I initially proposed. Generate rust gspell bindings: Create bindings for gspell, to be able to use gspell in rust applications. User Settings: Add the user settings panel and all backend functionality to handle the configuration of a user profile. Create Rust bindings for libhandy: First step to integrate libhandy into Fractal. Libhandy is a library to easily develop GTK applications for desktop and mobile. Create room settings: Improve the old room settings dialog, move to a panel and implement the new UI design. Refactor avatar loading and caching: Fractal used different ways to download and cache avatars. Code clean up and restructuring. Also move the code to generate the fallback avatar based on a the username to a separate library so it can be used by other projects. Spell Check: Add spellcheck to Fractal, based on gspell. I implemented this (though not with the UI we’ll eventually want) and it was merged, but since then we made some big changes to the message input widget and therefore it doesn’t work anymore at the moment. We also decided that other tasks were more important. I will work on this in the next couple of months. refactor room history: A big change to how the message history is displayed, loaded, and stored. This will lay the groundwork for a lot of new features we want, and the backend refactor we need to split the app. This is one of the biggest tasks I worked on during the summer, and I will try to finish it as soon as possible. Since we started restructuring the code base I had a lot of stuff to figure out and therefore it was delayed. Use libhandy to have adaptive columns: We want Fractal to work on big screens as well as on small screens and therefore we use a widget in libhandy to center columns and limit the width of, mostly, gtkListboxes. During the Summer I made also some other contributions, which were tangentially related to Fractal and my GSoC tasks, e.g. I fixed the GTK emoji picker layout and styling (this has been merged now, so look forward to a much nicer emoji picker in GTK 3.24). From the 2th of July I have been travelling from Italy all the way to the south Spain by train, to attend GUADEC 2018. During this long trip, I didn’t just sleep, but I kept working on Fractal and some other cool things. The biggest thing I worked on was the refactor of the code which handles avatar download and display in Fractal. I removed a lot of code because we had more than 3 different methods to load an avatar. Then I replaced the different methods with an easy to use function, which also handles the fallback when there is no avatar and it needs to be generated from the user’s name. I found that the fractal-api (which should only make http requests to the Matrix homeserver) had a dependency to GTK+. The code which was in the fractal-api to generate a fallback avatar using the username is now available for other projects on crates. 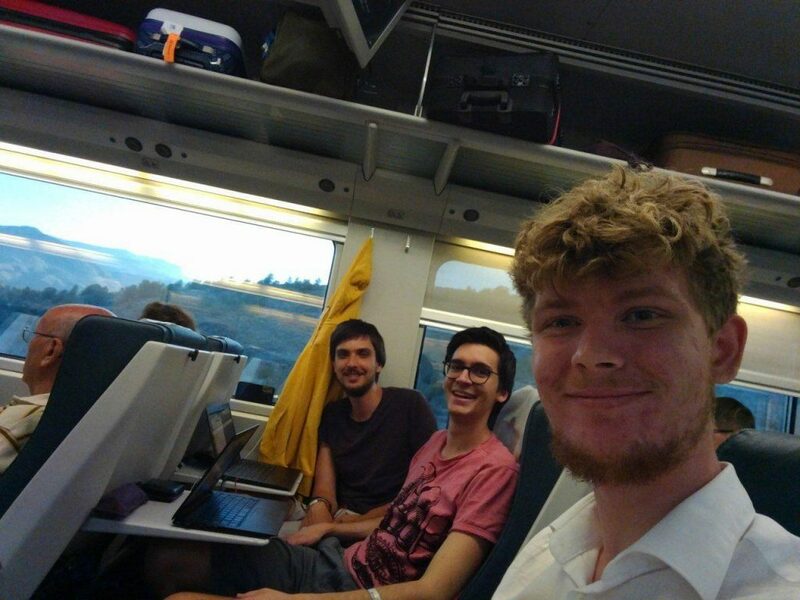 I was travelling with Tobias, and at some point we randomly met Bastian on the train from Madrid to Almera, so the travel turned into a hackfest on the train. 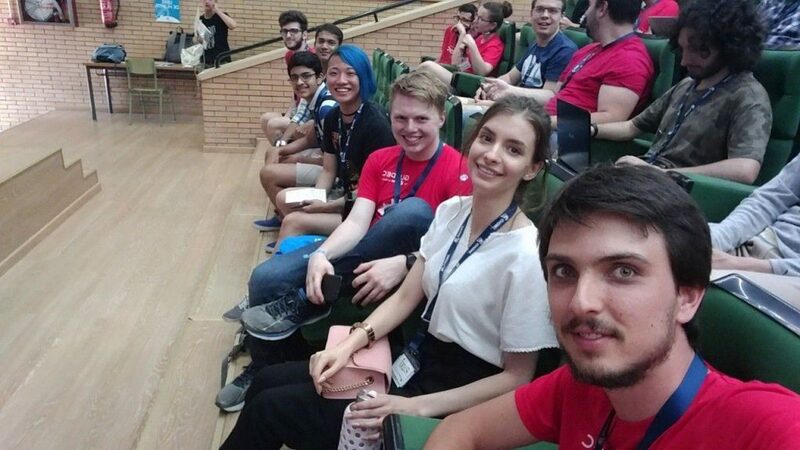 This year was my second GUADEC, so it was really exciting to see all people again I met last year. The most awesome thing this year was that many people where not strangers anymore, I knew them already from last year, from IRC or from somewhere else online. The last year was a really exciting year, because I got way more involve in GNOME than I’d ever dreamed of. This year I also volunteered to help out at the info/registration desk which was a lot of fun. I also gave a 3 min talk about my work as a GSoC student for Fractal. I also met all the other GSoC students and it was really fun to see so many young people working on GNOME, I really hope most of them will stick around also after GSoC. A few months ago, I created a small shell script to export slides form a svg file, but it uses Inkscape and it is terribly slow. During the conference days I started playing around with librsvg to export slides from a svg file, and learned a lot about librsvg. I can’t remember how the idea came up but at some point I was suddenly working on a rust app to export the Adwaita icons from the stencils svg file. This new approach looks really promising, as the new app exports all the symbolic icons in just few seconds. However, right now there are some icons which are not generated correctly, most likely because of rounding errors. I will investigate more and maybe make my first MR to librsvg. I wear a hoodie on a lot of pictures, because it was really cold in some of the rooms, and I can’t stand when the AC is directly over my head. Tobias and I took also the train to go back home, but we stopped in Granada and Madrid for a couple of days. During the trip home I finished the new room settings layout for Fractal, which was a big piece of work because I tried a couple of new things, which soon will be applied to other parts of Fractal, in order to make the backend split happen (which will in turn enable splitting the app into two separate apps). Our goal is to create two separate Apps for two different use cases: Banquets and Barbecues. For this split to happen we first need to make some changes to Fractal’s architecture. I think to keep Fractal maintainable in the future we need to simplify especially the AppOp struct, since it has been growing at an alarming pace (Don’t get me wrong I’m really happy that Fractal improves so quickly). AppOp is the struct which contains all widget references and most methods. Basically, it contains everything important. Also, a lot of Matrix related code is intertwined with GTK code, and therefore many tasks are handled in the main thread. The communication between fractal-matrix-api and the Fractal backend will stay the same. Therefore, the backend-loop will live in the backend, but instead of making UI changes directly, it will just store the new data, and then signal the main GTK application that it has to update the related UI component. The backend will expose a set of methods to give the main application access to the data and to change them. The main application will create all UI components and keep them up-to-date. At last we have the UI components which are “custom widgets”, such as the sidebar. A custom widgets has two public methods, one to create a new component, and another one to update its content. When the main application receives a UI update event, containing only information about which UI component should be updated, but no other data, the application uses the interface offered by the backend to get all needed information to call the update method of each custom widget. The update method then decides then which GTK widgets have to be destroyed, and which can be reused to display the new data. The first thing we can do is switch form Mutex to RwLock, this will already solve many UI freezes since we don’t need to look the data anymore to read it. Then we can start moving the current code form AppOp, where possible, to a custom widget (the Rust structs we are using right now). Each widget should have a create and an update method, for creating the new component and for keeping it updated without the need of destroying it first. (Address.rs is a widget example created this way). Most custom widgets already have the create method called widget() (if I remember it correctly) but they are missing the update method. We didn’t decide anything yet. I wrote this blog post to start the discussion about how to tackle the refactor and split, so input/comments/feedback are very welcome! In the last two weeks I have been working on the user account settings for Fractal. I can’t wait to get to the point where Fractal will work stand-alone without needing to use Riot for certain things, and getting complete account settings is a major step in that direction. Let’s start with the status of Fractal before I started my task. The only thing Fractal did was loading the display name and the avatar, and they couldn’t even be changed. I started creating the UI file which describes the view. I tried to focus just on the UI, in order to not overcomplicate my process. The first thing was just a dialog with all widgets without any behavior. The second step was to add all information already available in Fractal, like homeserver, MXID, avatar, and display name. Until this point the implementation was quite easy because it was mostly GTK code, which I’m quite familiar with. However, up until two weeks ago I had never touched the fractal-api code, so the rest was trickier. Most APIs, e.g. setting the avatar, are quite easy to implement. 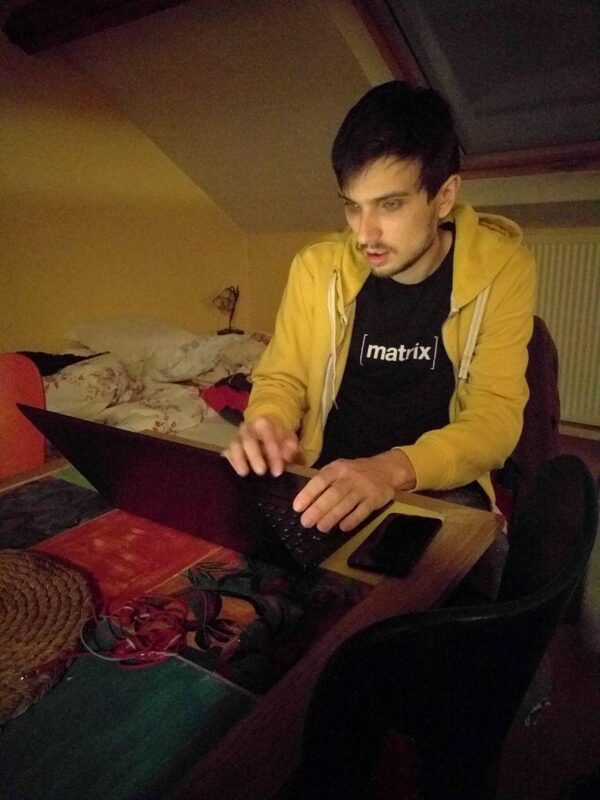 The most complicated are the calls made for handling third party identifiers (https://matrix.org/docs/spec/client_server/r0.3.0.html#adding-account-administrative-contact-information) (email addresses and phone numbers). It is not only about setting the new identifier, but the client has also the request a token to make sure the user is the owner of the email address. 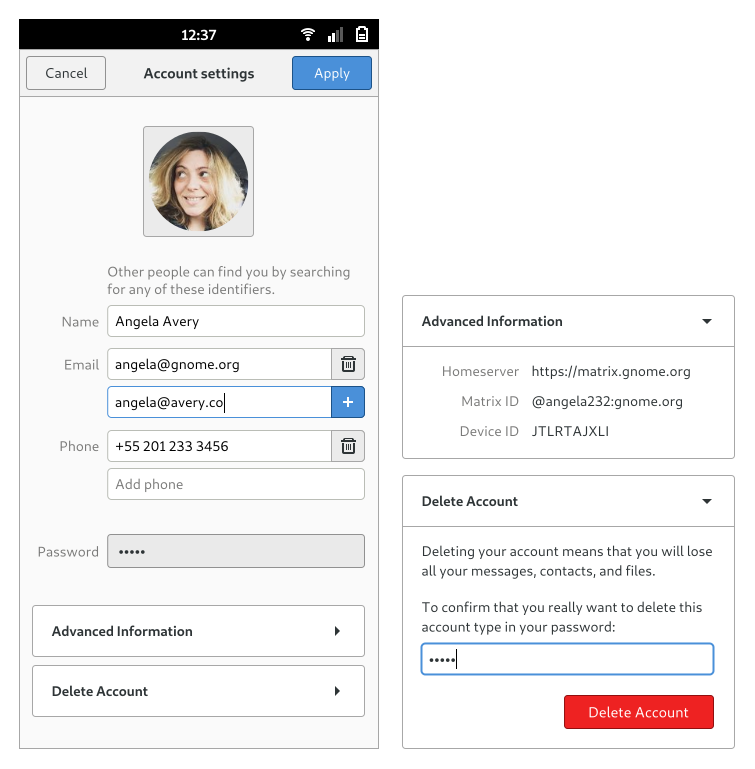 The user can now change the following settings: Avatar, display name, add and remove email addresses and phone numbers. Also, they can see the homeserver and their own MXID. I already added all the API calls except for the calls needed for account destruction. Over the next few days I will finish up the last missing things. Tobias and I talked about moving the account settings from a dialog to the main window, and removing the apply button, since the process for adding emails addresses needs a separate conformation (because it requires that the user goes to their email inbox). Also, for changing the password the user would have to confirm their changes twice, which doesn’t make much sense. We will probably make some more small changes on the way to make the UX as good as we possibly can. I’m working on issue #21 and this is my WIP branch.